Join the People of Detroit and Wayne County in Demanding a Moratorium on Tax Foreclosures and Evictions from Occupied Homes! Release the Hardest Hit Homeowner Funds Now! This is a State of Emergency! Under Michigan law, the Mayor, County Executive and Treasurer, and especially the Governor, have the authority to stop all foreclosures and water shut-offs to stop this disaster from taking place. 62,000 homes are scheduled for tax foreclosure on March 31, 2015. 37,000 are occupied homes. In the meantime, Lansing is sitting on $280 Million of Hardest Hit Homeowners funds, enough to pay all the delinquent property tax bills of occupied homes, stop the foreclosures, and provide funds to restore county and city services. 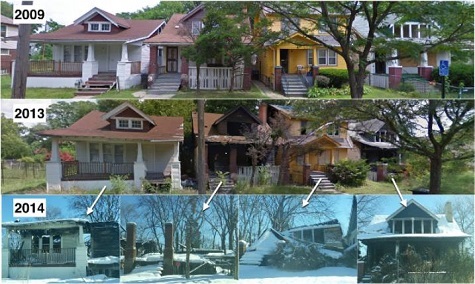 Instead these funds are being given to Dan Gilbert to tear down homes, while the banks are completely left off the hook for the destruction they caused.